Walkthrough video and strategy for Angry Birds Friends on Facebook Tournament Level #5 Week 89. Our non power-up strategy for this level is to fling the Yellow bird directly into the first tnt. The explosion should push the remaining structure to the right, and clear all the pigs. The score in the video below is 102,210. Our Angry Birds Friends Tournament walkthroughs show you how to obtain 3 stars and highscores with and without Power Ups. If you have a different strategy feel free to leave a comment below; however, don't just post your score via the comments. Tournament walkthroughs are added weekly as new levels come out, so be sure to check the walkthrough page. Are you looking for help beyond this weeks tournament? You have an idea, or need a challenge? 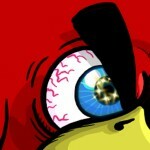 Be sure to check our Angry Birds Friends Forum. Hey there – in not sure what happened but there were no other threshold posts when I was posting this morning orcs never would have duplicated it. I came back and twice now it is appearing that @thee-Michelle posted first. I wasn’t stepping on toes, I promise you that only @joaoryo had posted his power-up strategies when I visited each page! Maybe you are 1:30 pacific (4:30EST) but it doesn’t differentiate? @maiasatara – this happend to me as well on a few previous tournament weeks. I posted some 3-star thresholds when no comments were there (except for joaoryo), and then later the posts from thee-michelle appeared with the times earlier than those of my posts. I think thee-michelle is in Japan, but I still don’t understand why this happens and the messages are not synchronized. 140,000 – 1 bird using Jingle Sling only. Aim yellow just above the first TNT so that the ornaments actually blow the TNT and the bird shoves the structure hard enough to the right that all other TNT blows the entire structure. So pretty! No PU’s, no special slings. 114K with two birds. Yellow bird with high arc at the middle(wooden plank and triangle), breaking the vehicle apart. Second half got almost destroyed and first half started to move forward but couple wooden blocks held it back. Destroyed these with second bird and first went down forward. I am inclined to think that my score was freak accident. How much I try first vehicle won’t move forward anymore, like it has some brakes somewhere. Debris falls on it, pushes and TNT explodes and pushes but it just won’t budge. Weird. Mystery solved as to why it won’t move. The front wheel is the brake. Shoot yellow and take it out and the whole rig rolls back. Not enought for big points but still solves the question as to why it happened once. I’m stuck at 111k with no PU maybe better by the end of week. Thanks, @terribletom! I was able to improve my score by 10k. Took several tries, but worked. Will try to match your score. Just aim to the metal over TNT. fling chuck at the very small bit of wood under the galss bside tnt.if chuck hits the tnt the level will again clear itself…..